Jam Roly Poly is one of those very traditional British desserts that probably shouldn't be eaten by anybody over the age of 21. Why? Because it is not exactly the kind of meal that is waistline friendly. If you are a weight watcher you should serve this one in very small portions. Incidentally, I am a weight watcher. I stare down at those bathroom scales and watch in wonder as the big needle goes up and up. I guess it doesn't help that I prepare, eat and publish these recipes every week! This recipe makes a very heavy pudding. Hungry kids will love it. 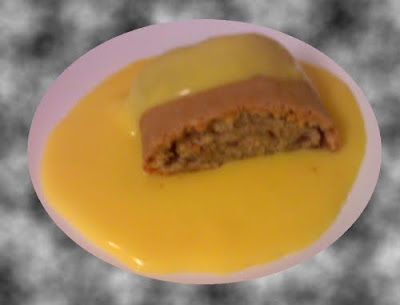 It is best served with Bird's Custard drizzled over it (actually, most British desserts are best served drizzled with - or drowned in - Bird's Custard). A couple of things are important if you want this recipe to be a success. First, use a good quality, thick jam and use lots of it. Some of it will soak into the dough during baking. Roll the dough up into a cylinder quite loosely and remember to seal the ends to stop the jam from seeping out of the pudding during baking. If you bake the pudding in the oven it will develop a crusty outside layer like a pie. If you steam the pudding the dough will remain soft. You choose. The quantities suggested will make enough to serve four guilt-ridden weight watchers. I know this is just full of calories but I have to make it. I have such good memories of my mom making this, she used to put in a tea towel and throw it into a pan of boiling water until it was cooked and of course we always had birds custard with it. I just drool when I think of it. Thank you for posting this recipe. I have fond memories of my Grandmother making this and steaming it for dinner. Yes, Birds Custard is a necessity for this, too.It's lovely to know that you take requests for recipes. I just sent this request this week! I woke up this morning still feeling full after eating my Roly Poly last night. The dog is going to get an extra long walk this morning.